So the name Podkamien means "at the foot of the Rock"
There are 2 areas in what is now Ukraine that are both referred to as Podkamen. This page is concerned with Podkamen (shown in red above) near the town of Brody, Ukraine. Latitude/Longitude 49° 56" / 25° 19"
The other Podkamen (shown in blue) is near the city of Rohatyn (or Rogatin), Ukraine at Latitude/Longitude 49° 27" / 24° 29" (34.2 miles SE of Lvov, 52.9 miles SW of Brody, and 49.8 miles W of Tarnapol). Please visit the Rohatyn ShtetLinks Page for more information. "Pidkamin is a place that undoubtedly deserves to be on the front page of The National Geographic Magazine. It derived its name from a huge hanging rock. In the 17th c. a wonderful Baroque church was built there, which made the view even more impressive." A view of the Rock over the town of Podkamen. Excerpted from a video taken by Howard Blue. Podkamen was in the former province of Galicia. The borders of Galicia were originally created as a province of the Austro-Hungarian Empire. Through the centuries the province was conquered and controlled by many different powers. In our most recent times Galicia was part of the Austro-Hungarian empire, the Polish Empire, the Russian Empire, and finally after World War II, was divided between the modern countries of Poland, and Ukraine. It is not uncommon for immigrants from Podkamen to report that they came from Galicia, Austria, Poland, Russia, the Soviet Union or the Ukraine. 1795 1919 Austria Poland divided by Germany, Russia, Austria. Galicia ceded to Austria. The Jews of Podkamen were mostly Hasidic. There were two Hasidic shuls (or kloizes). One was the Belzer and the other was called the Shattener. (The Shattener is actually spelled Husatyn.) Another shul in Podkamen was called Linas Hazedek. Around WW I, the city Rabbi was named R. Nathanson. The town sofar (scribe) was named Abraham Tomales. The earliest records of a Jewish Community in Podkamen are from the 17th century. Here is a pieced together history of the town of Podkamen. I wish to acknowledge those who have contributed to this "story" . Please contact me if you would like to correct any information, or add your own piece of the story. Prior to WW I, Podkamen was under Austrian rule. The Russians invaded the city during the war. At the time, the Cossacks used to walk the streets and ask everyone "How far is it to Vienna ?" Vienna was the capital of Austria and they were poking fun at the Austrians. Podkamen was heavily damaged during WW I, between 1916 and 1920 many of the inhabitants of the city were evacuated to evacuation camps in Austria or Hungary. There was a large exodus around 1920, many people decided to emigrate. Pittsburgh, Pennsylvania was a popular destination (Reason unknown), along with New York City, and Toronto, Canada. After WW I, Poland was reconstituted, and Podkamen returned to Polish control, until 1939. Russia "took over" the area of Poland in which Podkamen resided on September 1, 1939. This was part of an agreement between Russia and Germany called the Molitov-Ribbentrop pact. In this pact Russia and Germany split Poland between themselves in exchange for not attacking each other. Germany invaded the Podkamen area during the summer of 1941, thus breaking the Molitov-Ribbentrop treaty. The first Aktion (rounding up and killing Jews) took place in August 1942, the second near the end of September, 1942. On Dec 3, 1942 the remaining Jewish Community was deported to the Brody Ghetto. By May 1943, the Brody Ghetto was liquidated, and the Jews were taken to Majdanek concentration camp. Podkamen was liberated by the Soviet Union in March, 1944. During World War II most of the records for the Brody area, including Podkamen and Zalozce, were purposely destroyed by the Nazis. For this reason obtaining birth / death / marriage records is not easy. There may be backup records in the Warsaw Archives. As of March 1999, Alexander Dunai has been searching for the existence of these Podkamen records. When Howard Blue visited Podkamen in 1989 he filmed what remains of the Jewish Cemetery. As you can see in the following panorama the cemetery has been turned into a field. Source: Slownik Geograficzny Krolestwa Polskiego, Vol. XIV, pp. 354-5, Warsaw 1895. If you wish to view the original document on the PGSA web server click here (You will have to scroll down to the entry labeled "Zaloz~ce", or search for the word "Podkamien"). This is an example of the font chosen for the original document. It is rather hard to read. Do you have roots in Podkamen? Would you like to connect with others researching the same community? Click the button to search the JewishGen Family Finder database for Podkamien. Interested in finding other Shtetls? Click the button below to go to the top level of the Jewish Gen Family finder, and search for your own mishpuchah (misplaced). A true to life memoir with wonderful paintings about Jewish life in the village of Czernytsia (or Czernica), before and during the Holocaust. 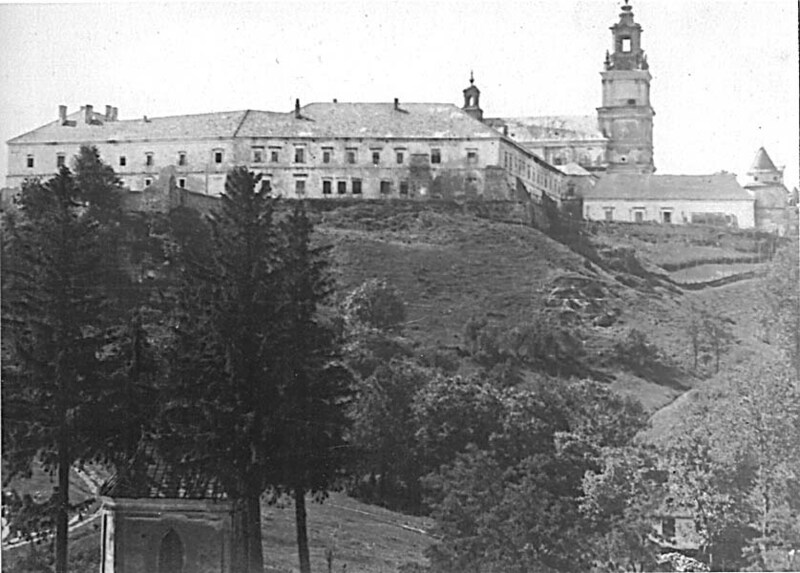 Czernica is 5km from the shtetl of Podkamien, and 20km from Brody. follow this link to see some sample paintings from the book! Contains an excerpt describing Podkamen from the Encyclopedia Judaica. This page is being maintained by Jim Stein. This site is part of the ShtetLinks Project and is hosted at no cost to the public by JewishGen, Inc. a non-profit organization. If you wish to support this project please visit the JewishGen-erosity page for more information.